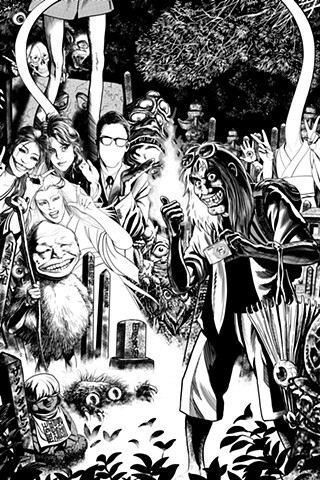 Stories I had done for 'Tales from the Crypt' up to this point hadn't involved monsters and I wanted to do something with the yokai of Japan, so I asked Zack Davisson to write a piece we could then offer up to the Crypt people. Unfortunately the series didn't last past two issues and a collected edition, so here's our unpublished story. It's about a dare game (kimodameshi) which in this case involves bullies sending a boy to a cemetery said to be haunted by a kubi kajiri (literally, 'Neck Chewer').